I have long wanted to visit Jaime Black’s art installation of RED dresses in the Museum of Human Rights in Winnipeg. January is a long cold month with not much to look forward to so I planned a trip with some friends to go to Winnipeg at the end of January. Winnipeg “fer Gawd’s sake” in January! 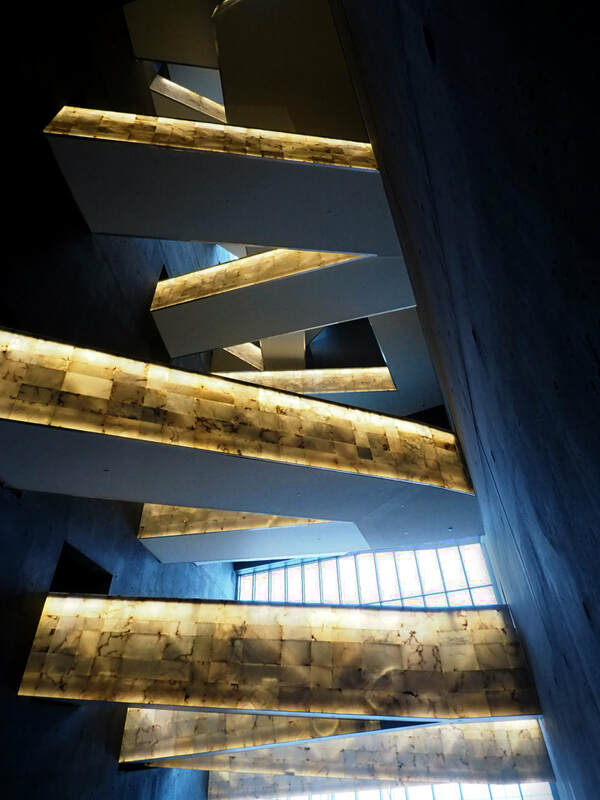 The Museum of Human Rights is a remarkable place noted for its extraordinary architecture and for its thought provoking exhibits. This National Museum invites you to explore and reflect on Human Rights in Canada and around the world. They are committed to respect, inclusion, cooperation and fairness, all relevant to everyone. There are eight levels to the building, the final being Israel Asper Tower of Hope. A 100-meter equivalent to a 23-story building. The tower offers panoramic views of the surrounding area. The second level is what interested me featuring Indigenous Perspectives. First Nations, Métis and Inuit peoples have concepts of rights and responsibilities based on worldviews in which everyone and everything is interrelated. It is here that Jaime Black’s permanent art installation is side-by-side with other exhibit alcoves featuring dozens of Canadian stories about action that is being taken by individuals to right human wrongs. 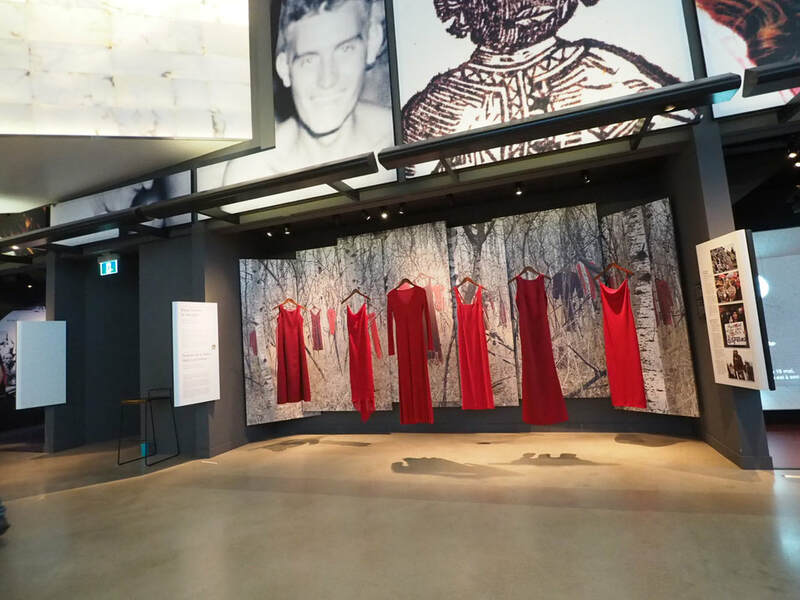 Six red dresses stand out from a backdrop of 10 large vertical photographic prints of red dresses in the woods. The guide said that in one of Jaime’s installations she hung 600 red dresses in woods. Sadly, I did not meet Jaime Black. However, I did see a large photograph of hers in the Boutique gift shop. It was a long vertical swirl of reds and oranges and yellows with a foot just discernible at the bottom; obviously a red dress in motion to which I can almost hear the drum beats. Its price: $1,900. We were fortunate to see a special Photography exhibit called Point of View featuring a juried show with 70 large photographs illustrating environment, expression, inclusion diversity and reconciliation. It was a Canada 150 Anniversary incentive and there were over 1,000 submissions. There was a winner in each category. Each of these five images was featured on the wall but on a table at waist level there was the same photograph in relief, so that blind people could feel the outlines and textures of the photograph. There were buttons to push so that you could hear a voice first telling you what the photograph was about and then walking you through how to feel your way through the photograph. We were directed to start at the bottom left, to follow the sleeve of a woman’s coat upwards and to the right where you would feel the texture of her scarf. Farther upwards to the right you felt three telephone poles in the land behind with the fields to the far right. To the right of that, three smaller telephone poles in the distance. Sure enough, my fingers could follow the story I listened to with my eyes closed. What an amazing experience it must be for those who have no sight to be able to “see” these five large photographs. The weather was bitter which meant that I did not meet with my old friend Mike Grandmaison, amazing Manitoba photographer (a former Edmontonian and active member of IACC). He now has 15 coffee table books and is working on six more. He sells fine art prints and has had many postage stamps made of his images. Oh well, maybe I’ll go to Winnipeg again soon and this time, I think I’ll choose summer.